South Dakota 4-H members attended the National 4-H Agri-Science Youth Summit at the National 4-H Conference Center in Chevy Chase, Md. (left to right): Nancy Lilja, CHS Foundation President; Bailey Feistner, Sanborn County; Cassie Richarz, Hamlin County; Jessica Kott, Brule County; Laura Alexander, SDSU Extension 4-H Youth Program Advisor – Brule and Lyman Counties and Jennifer Ringkob, SDSU Extension 4-H Youth Program Advisor – Marshall and Day Counties. BROOKINGS – Six South Dakota 4-H members attended National 4-H Youth Summits focused on Agri-Science and Healthy Living held at the National 4-H Conference Center in Chevy Chase, Md. “The National Agri-Science Summit was a positive experience because of all the amazing speakers and workshops. It opened my eyes up to all the different areas and careers in agriculture. In Washington, D.C., I was also surrounded by people, like me, who have a passion for agriculture,” said Jessica Kott, Brule County 4-H Member and State 4-H Agriculture Ambassador. In addition to Kott, the other 4-H youth who attended the National Agri-Science Youth Summit include: Bailey Feistner of Sanborn County, and Cassie Richarz of Hamlin County; youth who attended the National Healthy Living Youth Summit were Laura Bogue of Lincoln County, Tessa Erdmann of Brown County, and Sydney Hoffman of McCook County. Travel costs and expenses for the National Agri-Science Summit were covered through a generous sponsorship from the CHS Foundation. Travel costs and expenses for the National 4-H Healthy Living Summit were funded by a sub-grant through the Walmart 4-H Healthy Habits program. As a State 4-H Ambassador, Erdmann and Kott are among 19 South Dakota youth from counties across the state selected to serve. Developed to expand leadership opportunities for teens, the State 4-H Ambassador program offers opportunities to South Dakota teens because it is designed to engage youth in leadership development through all four 4-H program priority areas including: Agriculture, Health and Wellness, Leadership and Science. …Read more details about the event in this week’s issue of the Sanborn Weekly Journal! The students in grades 9-12 who are out for golf are pictured left to right: Megan Linke, Mariah Jost, Xavier Baysinger, Nick Snedeker, Cayden Slykhuis, Collin Schmiedt and Michael Schmiedt. Not pictured: Brayden Eagle, Andrew Lindgren and Katie Schmit. This year’s golf season has been off to a rocky start due to the wet weather. The only meet they have attended this year is a junior varsity meet in Platte so they could all get in at least one competition before half the season was over. Due to Winter Storm Wesley, it looks like they could have problems getting onto another course for a while. All meets this week have been cancelled and according to Coach Armando Rodriguez, their best possible option will be the meet they have scheduled for Friday, April 26. Despite their inability to get outside even to practice, the golf team has been in good spirits about the season, as they all enjoy the sport and are just happy to be able to work on their game together with a coach. There is some equipment the team owns that is strictly for indoor use, so they have been able to work on their putting and driving with the utility curtain in Woonsocket’s gym as a back drop. …See the rest of the golf schedule in this week’s issue of the Sanborn Weekly Journal. 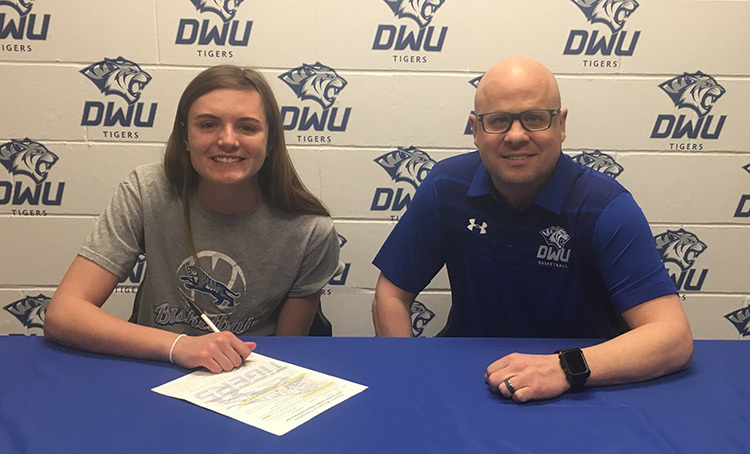 Megan Poyer from Woonsocket, shown above with Dakota Wesleyan Head Coach Jason Christensen, signed to play basketball with the Lady Tigers next season. Poyer averaged 12.3 points, 7.6 rebounds and 3.7 steals per game this season. She was honored with first-team All-Conference recognition for both 281 and CBH Conferences this year. She was also instrumental in helping the Lady Blackhawks get to the championship game of the 2017 State B Basketball Tournament and this year’s team to the SoDak 16. Her career stats include scoring 788 points, gathering 460 rebounds and dishing out 219 assists. She plans to major in nursing while continuing her basketball career at DWU in Mitchell.